Biological Anthropology: The Natural History of Humankind combines comprehensive coverage of the foundations of the field with modern innovations and discoveries, helping students understand, and get excited about, the discipline. Because the authors conduct research in three of the main areas of biological anthropology–the human fossil record (Susan Antón), primate behavior and ecology (Craig Stanford), and human biology and the brain (John Allen)–they offer a specialist approach that engages students and gives them everything they need to master the subject. The Fourth Edition continues to present traditional physical anthropology within a modern Darwinian framework, and includes coverage of contemporary discoveries to highlight the ever-increasing body of knowledge in biological anthropology. MyAnthroLab for the Biological Anthropology course extends learning online to engage students and improve results. Media resources with assignments bring concepts to life, and offer students opportunities to practice applying what they’ve learned. Please note: this version of MyAnthroLab does not include an eText. 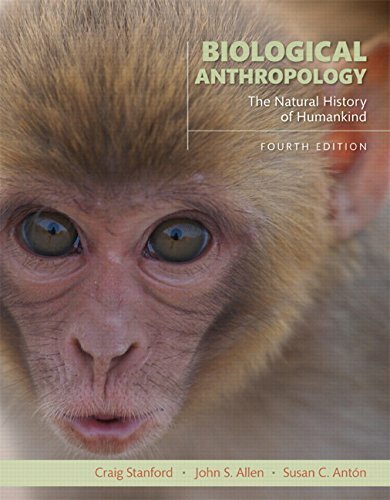 Biological Anthropology: The Natural History of Humankind, Fourth Edition is also available via REVEL™, an interactive learning environment that enables students to read, practice, and study in one continuous experience.